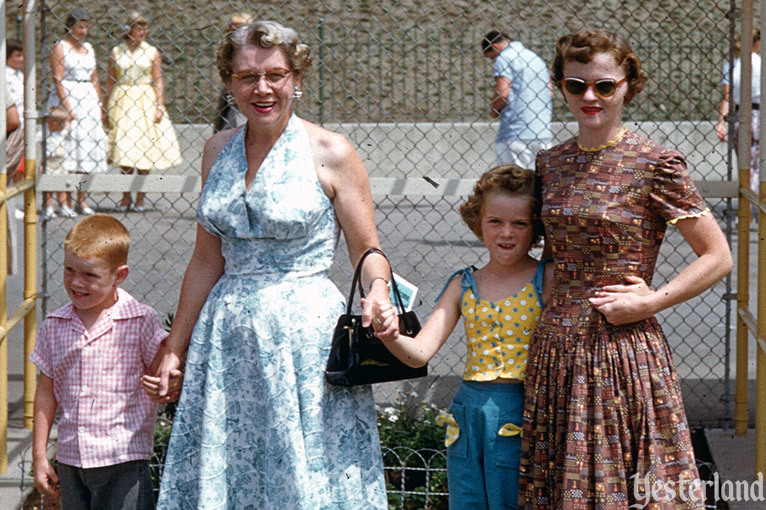 This visit to Yesterland takes you back to the 1950s and 1960s. 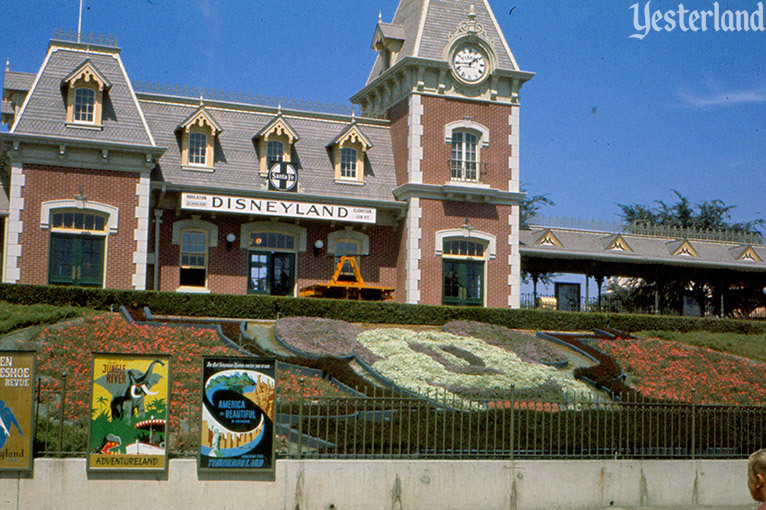 Perhaps you consider the early decades of the park to be its Golden Age, when everything at Walt Disney’s Magic Kingdom in Anaheim was perfect. Let’s look around the park entrance. 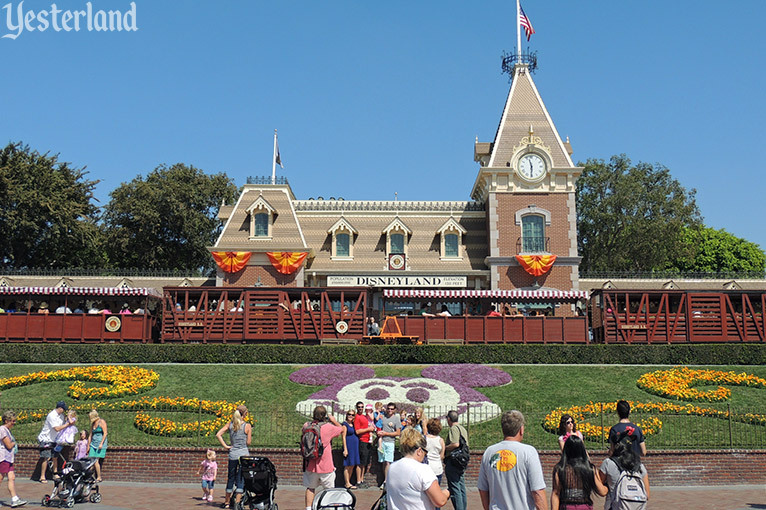 Even before you enter the park, you can take a snapshot of Main Street Station and one of the trains that stops there. As an added bonus, your photo will include the industrial chain link fence (topped with barbed wire) that separates the paid admission area from where you are now. 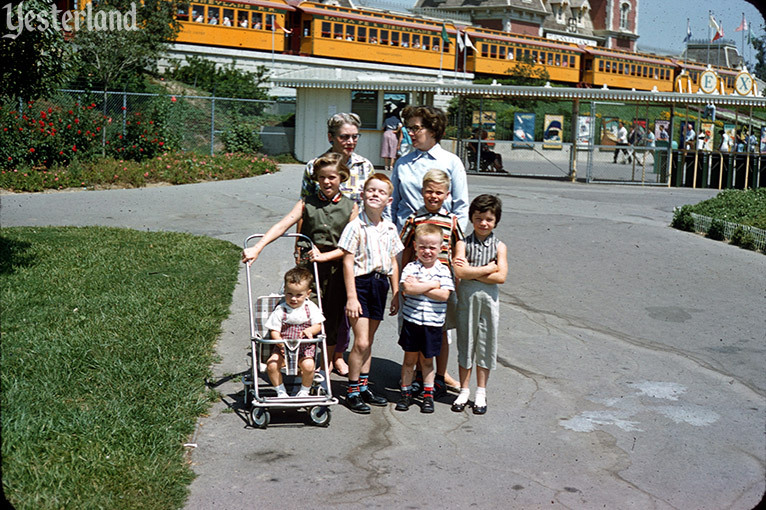 When your family poses for a photo near the west exit, the Passenger Train in the background looks great. And nobody will notice the stained asphalt and unedged lawn, right? Or pose your family right in front of a chain link fence. Once you pass through the entrance turnstiles, the floral Mickey Mouse head is always a pleasure to see. It makes a great photo background. The flowerbed is retained by a bare concrete wall. Here’s a photo tip for you: When you’re snapping a shot in front of the station, frame your shot so that it cuts off the bare concrete wall and the asphalt pavement. And try not to let a man with a hat walk into your shot. 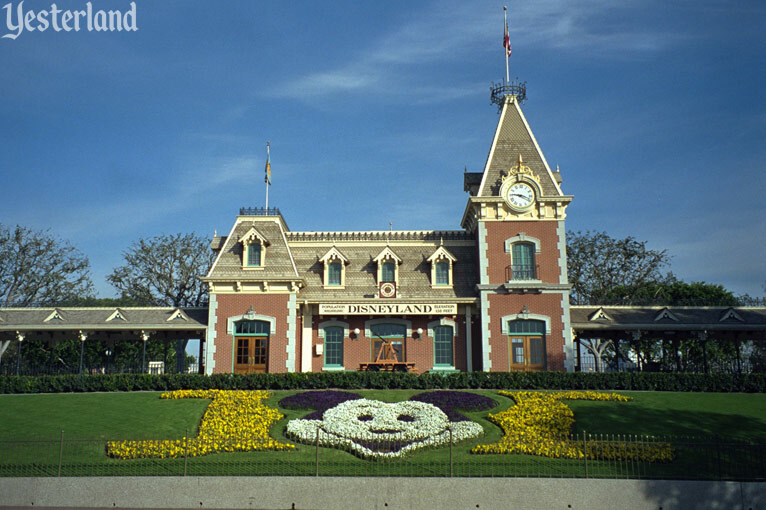 When Disneyland opened in 1955, the park entrance already had the iconic features that it still has today—the Mickey Mouse flowerbed, the handsome train depot with a clock tower, and the two tunnels on either side leading to the Town Square at Main Street, U.S.A. On the inside, the sidewalks were painted red concrete. But outside the park, the pavement was simply asphalt. 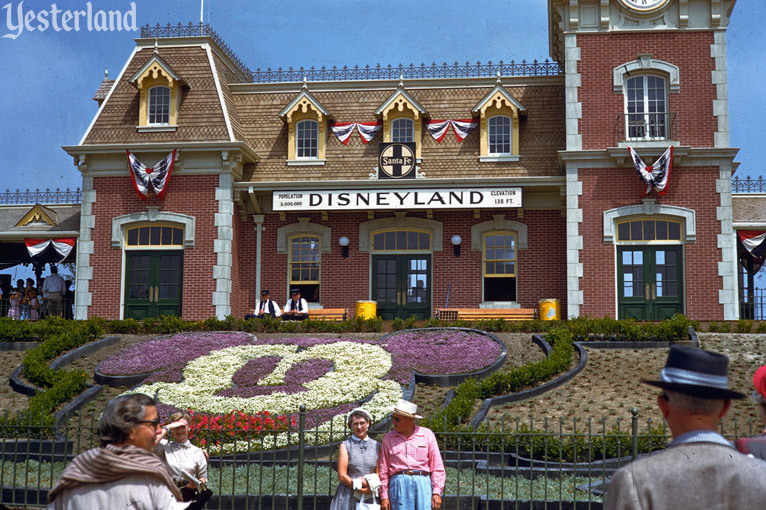 The photos above show that some things at Disneyland look better today than in the 1950s and 1960s. Before we look at recent photos, let’s look at three photos from 1998. By 1998, the asphalt entrance was long-gone. In early 1980, Disneyland put in concrete pavement, including a tree-lined “mall” extending into the parking lot. The concrete was painted brownish red. 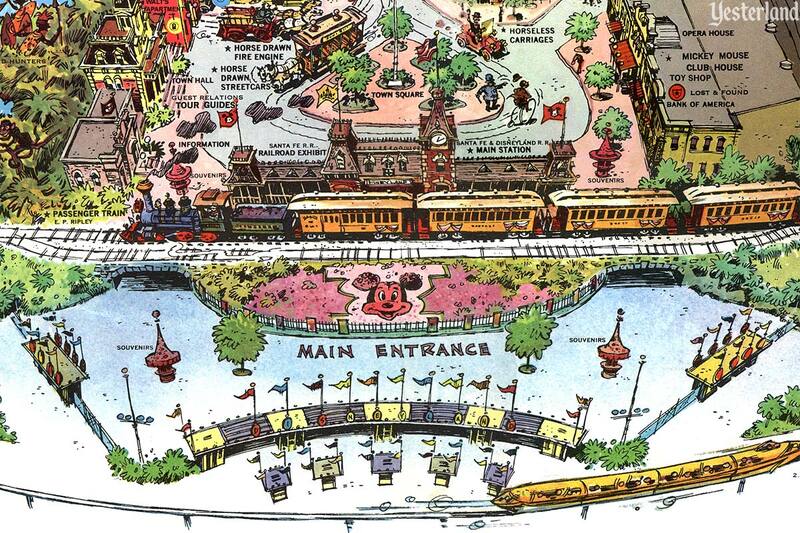 In 1998, the retaining wall on the flowerbed planter in front of Main Street Station was still gray concrete. 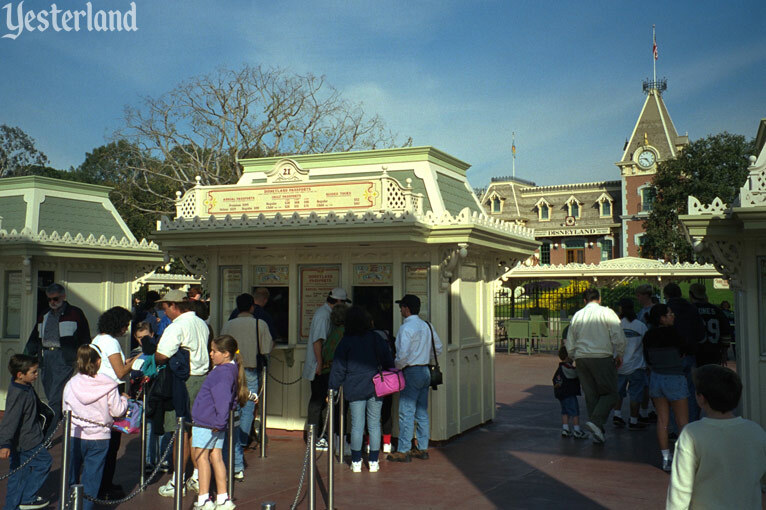 The 16 two-window ticket booths in front of Disneyland’s entrance gates were getting close to the end of their lives in 1998. 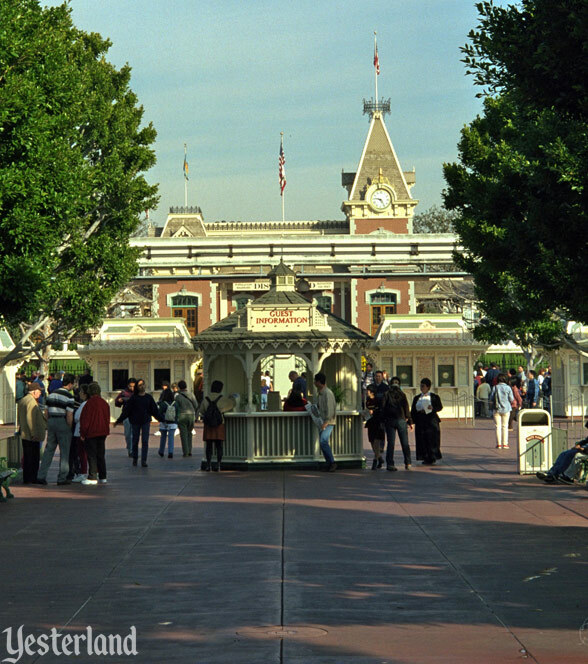 The current appearance of the Disneyland entrance is the result of work done in 1999. Here’s how the Los Angeles Times (“Disneyland Overhaul Set for Fall” by E. Scott Reckard, August 11, 1999) reported on the project. 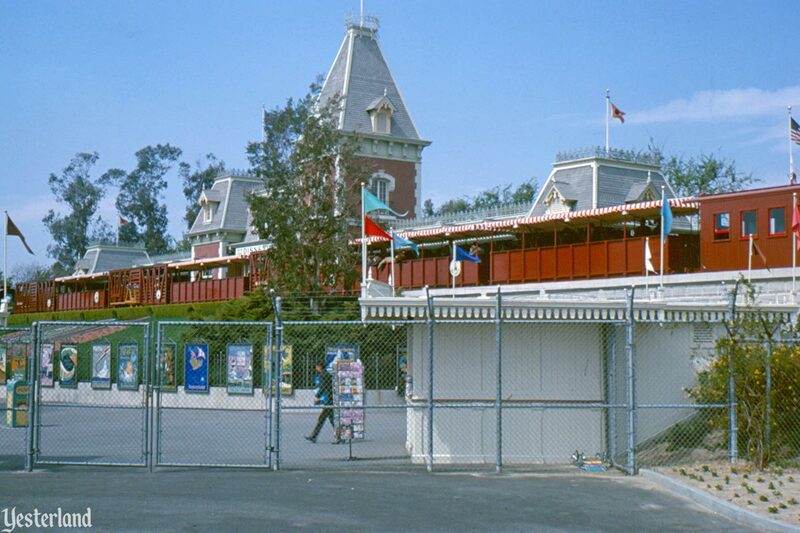 The major work on the main entrance included the construction of four entirely new ticket booths to serve the existing park and the second theme park, then under construction. Put into service in 2000, the new booths had a combined total of 32 ticket windows for the two parks—the same as what the old booths had for one park. 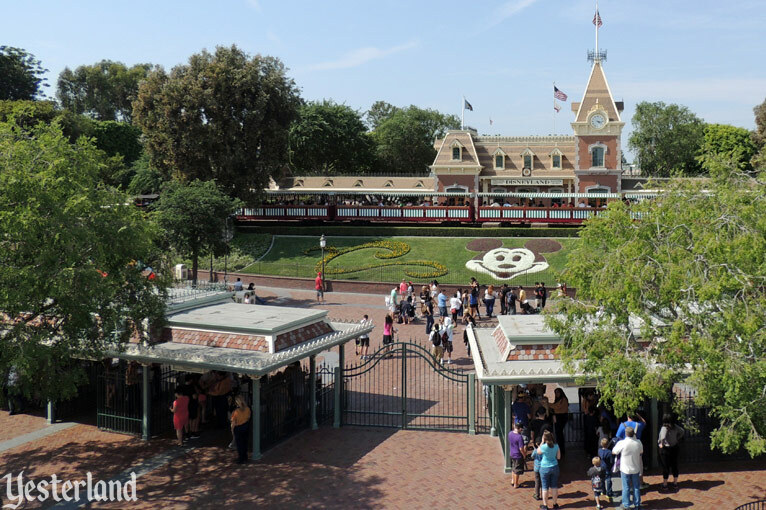 The major work also included the entrance enhancements—pavers, bricks, new entrance gates with Victorian details, and other embellishments—that we now enjoy (and take for granted) at Disneyland Park. The long tradition of the floral Mickey Mouse continues, only now the planter wall is red brick. Red pavers have replaced the red painted concrete which replaced the asphalt. The attraction posters that once blocked the flowerbed along part of the wall are long-gone—but fortunately such posters are still displayed in the entrance tunnels and elsewhere. A fence can be beautiful and functional. 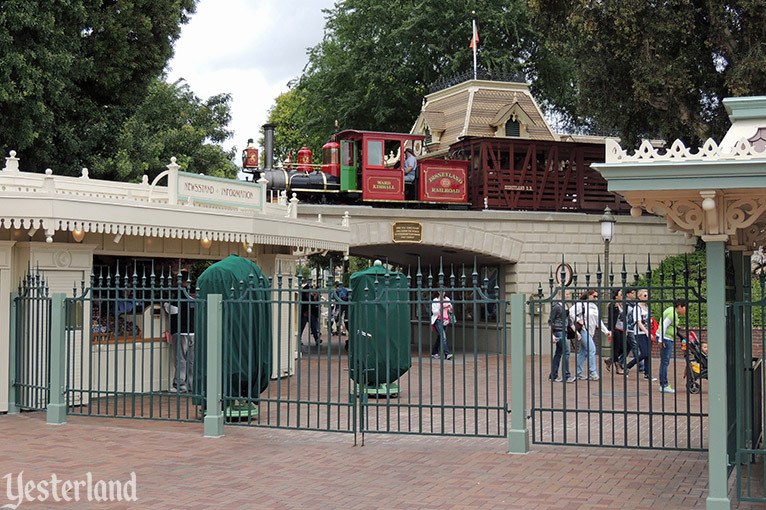 And that’s what the fences at the Disneyland entrance are now. 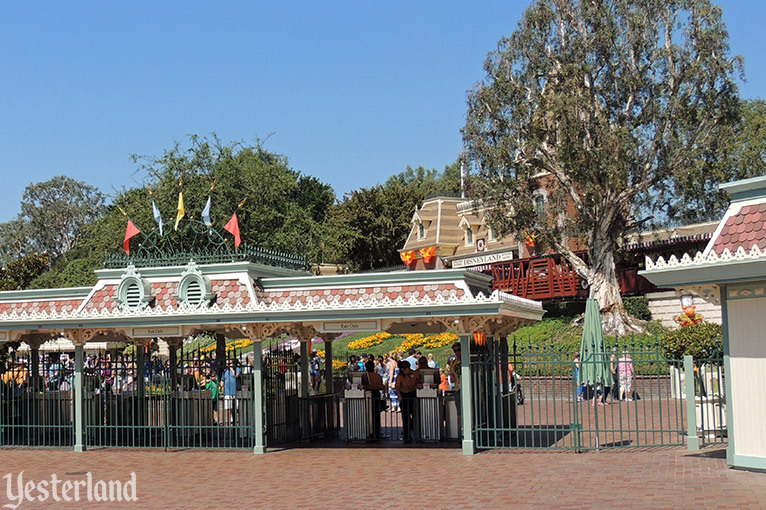 People miss many things from the Disneyland of long ago—but it’s doubtful anyone misses the chain link fencing.